Kendal Calling is a festival unlike many others and Getintothis’ Lewis Ridley braved the elements to see some stellar perfomances. Perhaps the most clichéd thing about music festivals in the UK is the uncertainty of what weather Mother Nature will serve up. Sketchy forecasts in the build up to Kendal Calling 2017 did mean however that revellers had an idea that most of its 12th anniversary would be welly-based. Those that make the trip into the fields in the Lake District are made of stern stuff though, and from Thursday morning right through to the grim journey home on Monday, they got stuck in and can take pride from being one of the festivals main attractions once again. The Shimmer Band kicked off Thursday’s Main Stage action and with Radio X‘s new DJ Peter Crouch tipping new tune Jacknife and The Death Call as his track of the day recently, it was one song in a set that was relentless in delivering a sound suitable for any festival evening. The natural bowl of KC’s Main Stage filled with seemingly more people than ever deciding to add the extra night to the festival. They were there, mostly, for sets from Happy Mondays and Franz Ferdinand. The former was fronted by an on-form Shaun Ryder, perhaps not on-form for his vocal performance but rather for his comments between songs as he looked down at a setlist he seemingly hadn’t a clue about. Bez, wearing a knee support to aid his side-stage antics entertained the crowd, stepping back in time as if it was still 1984. Rowetta‘s voice is still huge, and the crowd responded to her soulful cry in the bridge of Step On, the expected highlight of the set. Following The Mondays, Franz Ferdinand brought their hits to the party, the likes of Do You Want To and Take Me Out were responded to by the biggest Thursday night crowd we’ve seen in eight years at the current venue. Kendal Calling‘s strength has always been variety, and the number of venues in the festival means you can engage in a number of different atmospheres. A real favourite is the House Party, and it was there and the Main Stage that Friday belonged. In the early afternoon, Hello Operator pulled in a big crowd for their set. It’s pull-out-the-stops rock and roll and they do it well. Across on the Main Stage later in the afternoon the highly-rated DMA’s performed. The lads from Sydney have earned a large following in the UK and their tracksuit and cap look is one that adds to their young, cheeky style. They kicked off with Play It Out but highlights were Delete and Step Up The Morphine. Another album is imminent and they’re no less at home in Cumbria than Down Under. Cabbage‘s House Party set was one of the most anticipated of the weekend, a venue that suits them like no other and fans packed it out. Songs from their new EP, Celebration of A Disease featured in an 11-song set. Co-frontman Joe Martin led popular track Dinner Lady and Lee Broadbent paused before Tell Me Lies About Manchester to dedicate it to the Gill family. Craig Gill, a member of Inspiral Carpets, took his own life in November 2016 and it was a touching moment to be a part of as the band dedicated one of their most popular songs to the family at the barrier in the House Party. The biggest headliner of the weekend was always going to be Stereophonics, and for a festival headliner an outstanding quality is to be able to surprise fans with the amount of songs they know. In total, they played 24, a huge headline set. Small in size but big in voice, Kelly Jones at one stage performed sections of Highway To Hell, Gimme All Your Lovin’ and Dancing In The Dark to create an atmosphere more like a Glastonbury headline set than little old Kendal Calling. f the songs they actually lay claim to, A Thousand Tree, Local Boy In The Photograph, The Bartender and The Thief and Dakota may be the best songs a set has ever closed with and it was one which left nobody disappointed. Kendal Calling can be satisfied with their headliner of headliners, and it was only Friday. Dave Haslam‘s set at 1.30am featured Tony Walsh’s This Is The Place, the poem made famous in the aftermath of the Manchester Arena attacks earlier this year. Haslam exclaimed that then and now, when that night is ever in mind, ‘we are all Manchester’. Saturday, and Reverend and The Makers pulled in the masses on the Main Stage for their afternoon slot. Frontman Jon McClure is an entertainer, and as he rattles through the set with his towel aloft the crowd warm to the band from Sheffield. Their slot ascends to Silence Is Talking, the horn section of which is chanted long after they leave the stage. Tim Peaks is often the place to be in KC afternoons. Colour Me Wednesday performed with Tim Burgess himself in attendance with coffee, vinyl, street food and famous faces galore at the Diner. One of the famous faces taking to the Main Stage was Brian Wilson on Saturday evening. With his band, he performed Pet Sounds in its entirety. Sloop John B was a singalong highlight, while Al Jardine‘s vocals were still shown to be up to scratch as he led Help Me Rhonda. California-style shirts and inflatable alligators were in the crowd as Barbara Ann and Surfin’ USA featured in the latter part of an 18-song set. Surely a highlight of the whole 12 years of Kendal Calling. Testament to the festival’s year-on-year strength in depth, it was a toss-up between The Hunna at Calling Out and Manic Street Preachers as Saturday night’s headliners. Both stages were packed out for the headline sets with one set of fans treated to 19 of the Manics best – ending triumphantly with A Design For Life-and the other one with of the most talked about bands in the UK since their debut album in August last year. The Lancashire Hotpots are Kendal Calling favourites, and many videos have surfaced since their Sunday afternoon set of first-timers bemused at Eggs, Sausage, Chips and Beans being discussed on the Main Stage at Kendal Calling. Slaves appearance was slightly different but in many ways similar, their image is also unique and has attracted fans across genres. Their heavy sound is scarcely matched and this has led to their success. From an up-and-coming band to members of a band with legendary status, Pete Salisbury and Nick McCabe‘s appearance at Tim Peaks was hardly the best-kept secret. They played four songs with Charlatans guitarist Mark Collins including Catching The Butterfly and The Rolling People with guest vocalist Denise Johnson, most known for her backing vocals on Primal Scream‘s Screamadelica. For Verve fans it was a once in a lifetime, for non-Verve lovers the quality of music produced in a short set was a moment to remember. Another moment 2017 written into Kendal Calling history. Another legend is Seasick Steve, he’s been in these parts before and drew a huge Main Stage crowd once again. His blues rock style is one many artists have been inspired by, beard, tattoos and all, he combined some of his best hits with his humour and crack suited perfectly to the festival. On Sunday night, The Coral headlined Calling Out and with Frank Turner and Tinie Tempah on the Main Stage it was another evening that would split the masses largely in two. This was after a secret set by The Coral at Tim Peaks, though. When a crowd is spilling out of the doors of the Diner you know it’s someone special, and to the lucky few in there it was yet another highlight. Their less secret set, featuring Jacqueline, In The Morning and Dreaming of You had the lads from Wirral right on form, upon the close of their set fireworks shot into the Cumbrian sky. Kendal Calling ended with Nico Mirallegro‘s DJ set in Tim Peaks, a combination of house and indie classics. 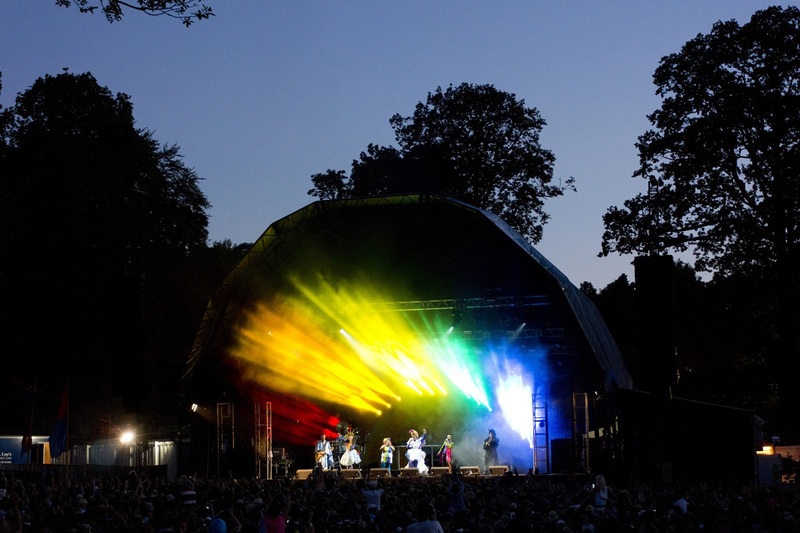 Elsewhere, thousands of festival goers were left disappointed as Y Not Festival was cancelled on Sunday, and although circumstances blighted that festival, it is worth noting that the people who make Kendal Calling what it is deserve credit for yet another brilliant year in the fields. Andy, Ben and the organisational team beforehand, security, stewards and from the staff in the real ale tent to those dishing out your chips cheese and gravy at 5 in the morning all play their part. And of course, if you were there, you. For getting stuck in, for giving those little bands a chance, for packing out stages from Thursday to Sunday. People come back to Kendal Calling time and again and the gradual expansion of the festival means more and more people want to get involved. When line-up announcements start to trickle through over the winter, who’d bet against another record sell out? Not us.